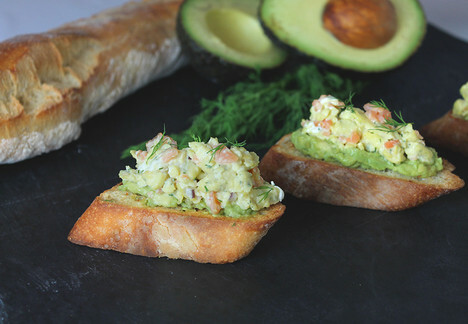 Individual baguette slices, toasted and topped with mashed avocado, scrambled eggs, dill, smoked salmon and nuggets of warm cream cheese. Preheat a medium nonstick skillet over medium heat for 1 minute. In a medium bowl, whisk together eggs and dill. Add eggs to skillet and cook, stirring frequently, until no longer runny. Stir in cream cheese, salmon and red onion. Season to taste with salt and pepper. Spread avocado on toast. Season to taste with salt and pepper. Top toast with egg mixture. Serve immediately.